An einem Punkt am schönen Morrison Lake gelegen, ist dieses 4-Zimmer-Haus mit einem gemauerten Kaminofen das ganze Jahr über ein willkommener Rückzugsort. Sie können zu Fuß zum 18-Loch Morrison Lake Golf Club am Ende der privaten Fahrt gehen, eine Linie von der Anlegestelle für Bass und Bluegills werfen oder Wasserski auf diesem 320 Morgen großen See mit einer Insel genießen. Nur 25 Minuten mit der Schnellstraße in die Stadt Grand Rapids und einem internationalen Flughafen. Dieses Haus verfügt über Parkettböden im Erdgeschoss und einen beheizten Whirlpool im Obergeschoss mit Blick auf den See. Das große Schlafzimmer im 2. Stock verfügt über eine gewölbte Decke und Schiebetüren zu einem Balkon. Ein Schwimmfloß, Paddelboot, 12 'Aluminium Fischerboot mit einem elektrischen Trolling-Motor, Dock und Motorboot-Lift sind alle enthalten. Third-Party-Ponton-Verleih ist ebenfalls verfügbar. Das Haus am See liegt nach Osten, so dass die Sonne Sie am Morgen willkommen heißt, aber Sie nicht blenden wird, während Sie sich nachmittags auf dem schattigen Deck entspannen. Genießen Sie Ihren Blick auf den See von der Terrasse, Balkon oder um ein Lagerfeuer unter den Platanen! Ausgezeichnetes Angeln vom Dock aus mit Schwimmfloß, Paddelboot, Bootslift, 12 'Aluminium-Fischerboot mit elektrischem Trolling-Motor. Vermietung von Drittpontons möglich. It was very nice. Lots of things available to use. We wished there was one more bedroom upstairs. Swimming raft was lots of fun! Owner was readily available if there was problems. Most of the house was fairly clean. Very nice, large, back yard with shade, sandbox, benches and firepit. Parking was difficult for 3 vehicles and a trailer. Owner was very helpful with this issue. It was nice that Wii and Netflix was available. Also it was nice to have a washer and dryer. 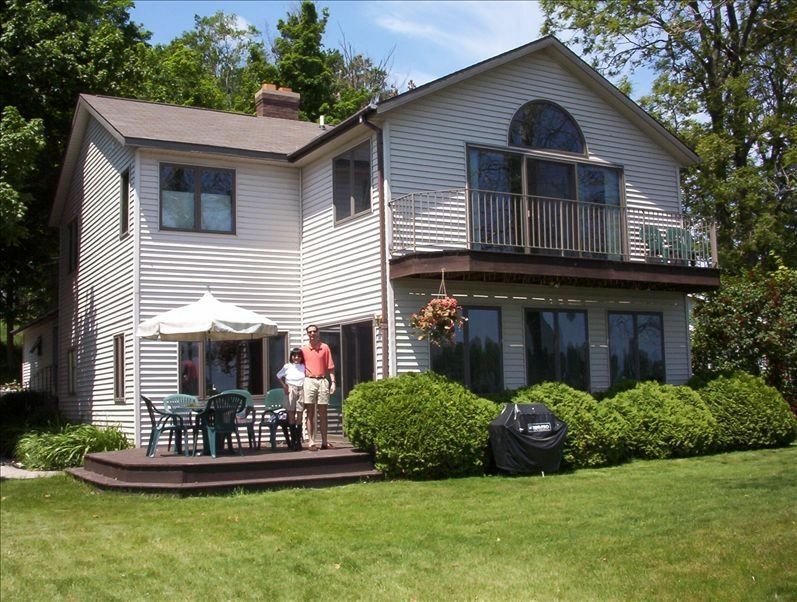 Spent 5 days at this very nice home in Saranac MI for our son's graduation at Calvin. Everything we could have dreamed of and more! My husband and I rented out the Lake House for our wedding ceremony and for our family getaway week. We had a few family members staying for the week and a larger number of guests coming for the ceremony. It was by far one of the best experiences we could have ever had. The owners were friendly and absolutely accommodating. The property was clean and organized. They answered all of our questions promptly and their listing of amenities was spot on - not to mention a few other amazing aspects of the house that you would have to really see to believe. To be honest we had a hotel room at the Amway Grand the night of the wedding and were happy to be "home" to the Lake House the next day because it was so much more comfortable and relaxing. The master bedroom, bathroom and living room windows overlooking the lake gave us a breathtaking view every morning of the sunrise, blue herons, and that calm and tranquil mist over the water. Picture perfect. The afternoons were sun filled with swimming, boating, grilling, and games. Our evenings concluded with starlit views from the dock and smore's and wine with friends around the fire pit. We would recommend this property to any family gathering - especially an intimate wedding ceremony. We were married between the two large trees on the water and we were able to very comfortably fit 65+ chairs for our ceremony guests in the yard with plenty of room. This was the perfect setting for it. We can't wait to book for future anniversaries! We returned to Lake Morrison this summer after a 5 year absence. Five years ago the grand kids were 2,3,4,5 and now 7,8,9,10. I wondered if it would be as good a fit. No need to worry - it was perfect. It is a house for all ages to enjoy. The owners are wonderful and right there if you need anything. They are also very generous in allowing us the use of their boats, toys, fishing gear, etc. It was a wonderful week and now all i hear from the grand kids is "when can we go back to the lake?" We look forward to your return! Had a great experience on Morrison Lake. The owner took us on a tour of the home when we arrived. The home had plenty of room for the four of us and also was great for entertaining large groups for dinner! The lake had a sand bottom and was shallow for the kids to swim in. We had fun on the paddleboat and went fishing on the motor boat a few times. Overall great experience and we would love to do it again! Our 3-generation vacation went very well. There was something for everyone to do, and it is close to the airport. Kids enjoyed swimming and the raft, plus water skiing. The house had plenty of space for all of us, as did the yard. Owners were very responsive to our needs and questions. We especially appreciated the book of directions for things in the cottage and the area, and the tour of the house given by the owner. We will be back. Tragbare drei Personen Fischer Shanty und mehrere x Laufskiern zur Verfügung gestellt. Sandkasten in der Nähe von Wasser für Kinder. Modellflugpark und exotischer Streichelzoo in der Nähe. Third-Party-Ponton-Vermietung verfügbar. During the summer season, nights in addition to the 6 night minimum are discounted by $50. Available adjacent days of less than the summer minimum of 6, between reserved weeks, are rented on a minimum 3 night basis as in the off-season.